I love sitting next to the window while travelling. I love watching the trees, the houses, the people pass by. I love the strangeness of it all. While going to Pondy from Chennai, I did have a window seat but the blazing sun did not let me draw open the curtains. The next best thing to do was to do nap and I did nap but not for long. I was sitting by myself with no one to talk to so I decided on watching a movie recommended by someone who knows movies. My eyes were fixated on Brad Pitt knocking out a guy twice his size on my teeny-weeny screen when suddenly loud music in Tamil broke out from nowhere. I paused my movie and looked up to see that they were screening a movie in the bus. Awesome. Wow. The only problem? I knew only a few words of Tamil (mostly swear words taught by my TamBram internet friend) so I could not understand anything happening in that Tamil movie. Nor could I watch Brad Pitt beat up any more guys because the Tamil movie was very loud. Finally, after three to four hours in the bus, we landed in Pondy. I loved Pondy right from the very first glimpse of the endless blue ocean. What can I say? I’m a sucker for Poseidon. The place we were staying at was called Les Hibiscus and it was on Rue Suffren. If you ever happen to go to Pondy, I will highly recommend Les Hibiscus to you. You won’t meet a nicer person than the owner, Pascrane Uncle in the whole of Pondy. 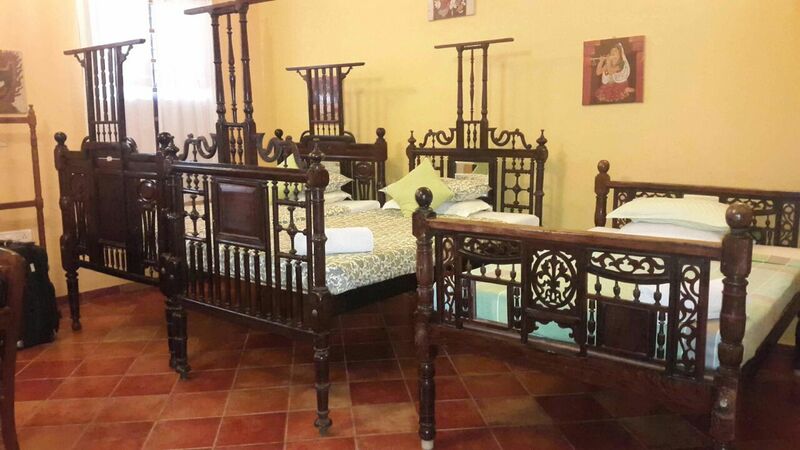 Our room was a beautiful blend of Franco-Tamoul culture with colonial furniture and paintings of Hindu goddesses. The weather was way hotter than what I had anticipated. 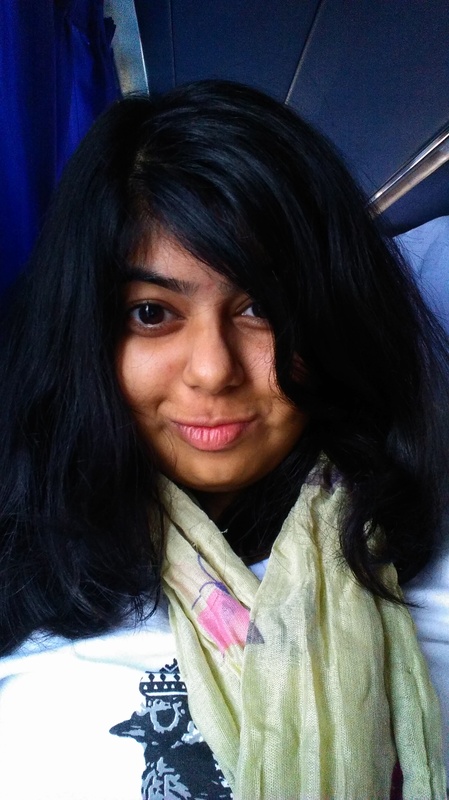 I am a Mumbai girl, a summer child. I have never seen a winter that wasn’t mild. But the heat on the east coast was a real, living monster. My friends and I sought refuge in our cool air-conditioned room from this vile creature. Too lazy to get out of the pyjamas we had put on, we decided against venturing out for dinner. We chose to order pizza from a place called Farm Fresh. Why pizza? Because pizza. Dee is a vegetarian so she opted for a regular Farm Fresh pizza while Tash and I being the meat-lovers we were opted for something large and with chicken. The small pizza turned out to be the same size as a medium one from Domino’s and the large pizza turned out to be someone that could fill Joey’s stomach for sure. Nope. Not even a little bit. Screw weight gain. Screw dieting. We devoured the pizzas. Farm fresh had enough vegetables for it to qualify for a vegetarian pizza. 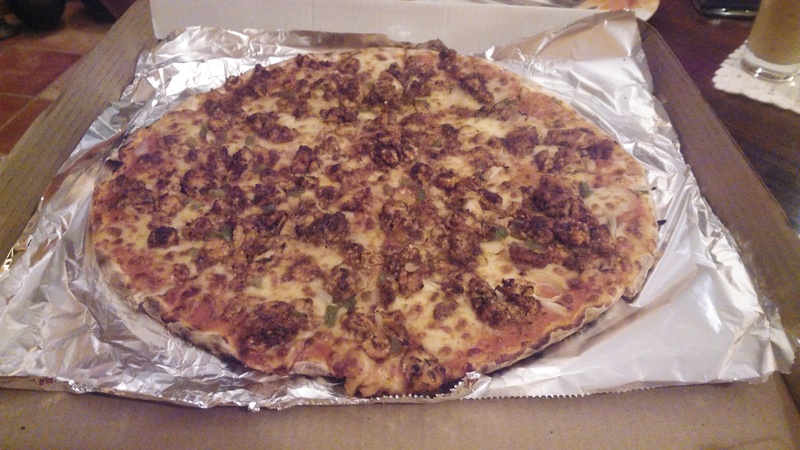 Every slice of the chicken pizza had more chunks of chicken than an entire Domino’s pizza. The pizzas also had proper cheese that made our vacation start on a cheesy note. Did I mention that the base was sourdough? Have you tried a sour dough pizza base? No? Then, you are missing out on something splendiferous. 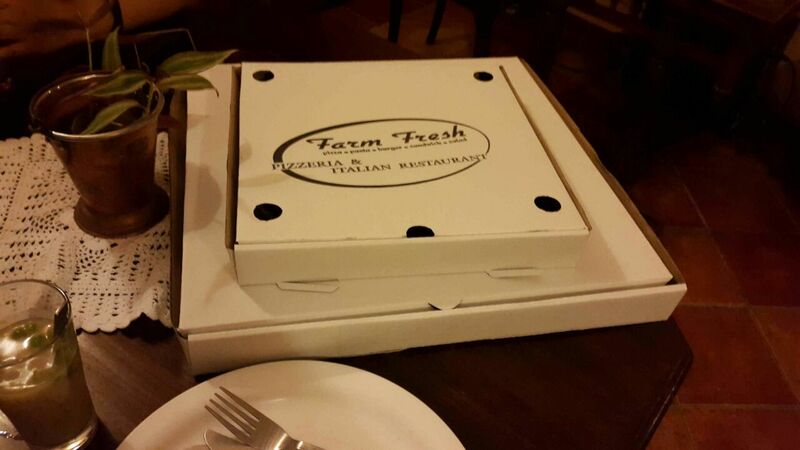 When I visit Pondicherry again, I am definitely ordering a pizza from Farm Fresh. 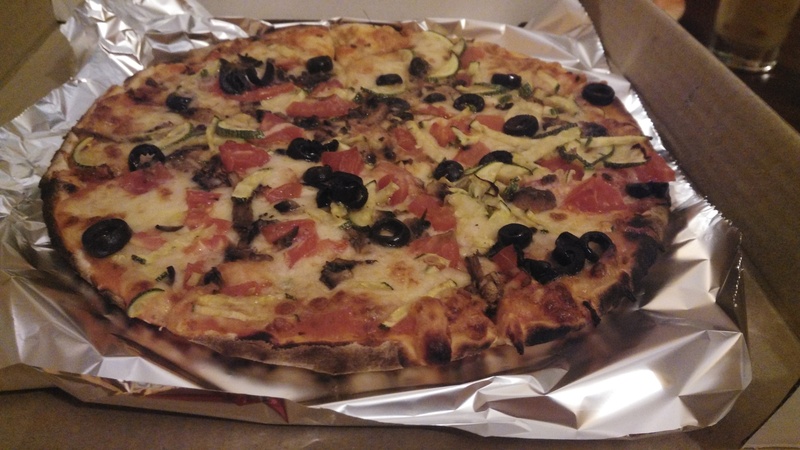 It was the second best pizza I have ever tasted and I have eaten a lot of pizza. Our tummies were now bloated. Our senses satisfied with the gustatory pleasure they had received. The three of us now slithered into our beds and fell asleep. It was the start of a week of the most sound sleep I would get in the 20 years of my life.